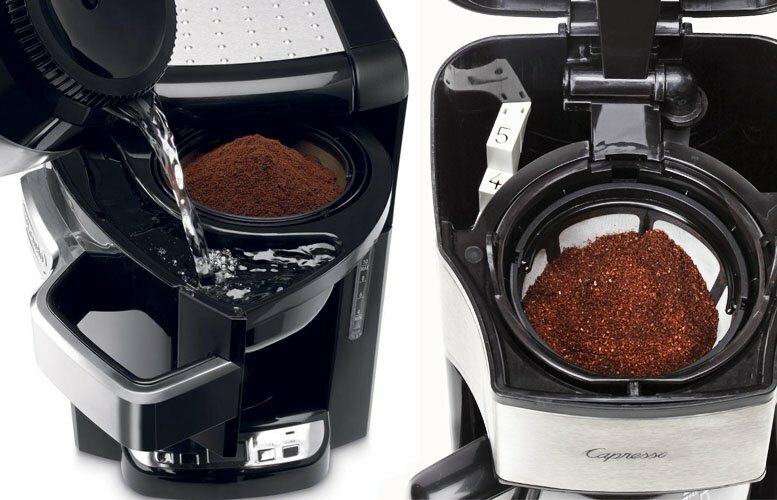 The name ‘drip coffee maker’ speaks for itself – the drink fills a cup drop by drop. This home appliance is great for brewing coffee both at home and at an office. Once the device is switched on, the water heats up and emits steam. It condenses to water, reaching a certain temperature (85-90°C). These hottest drops pass through the coffee grounds, which fill the filter, and trickle down into a glass chamber. Now the drink is ready to be served in cups. These appliances are very user friendly and affordable. No wonder, they are widely available. The more powerful a coffee maker is, the faster the heated water goes through the fine grinding beans. This makes the drink rather thin. Vice versa, in a less powerful device’s brew basket the water stays longer, and the drink takes in a lot of flavor and aroma. All drip coffee makers feature a filter, which contains grinding beans. Different models have different types of filter. Disposable filters are made of waterproof porous paper. The ability of removing harmful alkaloids (cafestol and kawheol) from coffee has earned them great popularity. Another advantage is that they do not need to be rinsed and are just disposed of with the remaining grounds. A paper filter should be replaced after each brewing. Nylon filters feature a plastic gasket, covered with a piece of nylon net. They often come with appliances. Instruction manuals say that a nylon filter must be replaced after 60 uses. Actually, they work for much longer. Gold filters look similar to nylon ones except they have a titan nitride coating, which makes them stronger. Therefore, a gold filter is more durable and expensive than a nylon one. A coffee maker’s capacity allows you to brew 1 to 1.5 liters per cycle. The lower threshold is usually one or two cups. When choosing an appliance, note how much coffee your family members usually drink. If you are buying a coffee maker for your office, it is advisable to look for a bigger one. Carafes are made of glass, plastic, and metal. Glass carafes do not leave odors. A drip lock is a mechanism, which blocks the supply of liquid when the carafe is removed. Once the carafe is back in its place, it will unplug and fill the carafe with coffee right away. A heater is crucial for coffee makers with large brew carafes. It is incorporated in the bottom and maintains an optimal temperature (65°C or higher) for up to two hours. Water level indicator helps you to adjust the amount of liquid in the reservoir. A water tank can be removed easily, and it will prevent you from spilling water on the electric element. A timer allows you to prepare everything you need for brewing before sleep, as you can set it up to finish brewing by the time you wake up. A stain sensor will prompt you when you’d better clean filters and rinse the appliance. The anti-overflow function will stop the brewer once the carafe is filled to the rim.